The rich live highly privileged lives, in complete luxury and with access to phenomenal health care. Everyone else (the vast majority of humanity) lives in slums, dangerous places with brutal police, uncaring bureaucrats, and general misery. Oh, and it’s 150 years in the future, and all the rich people live in space. 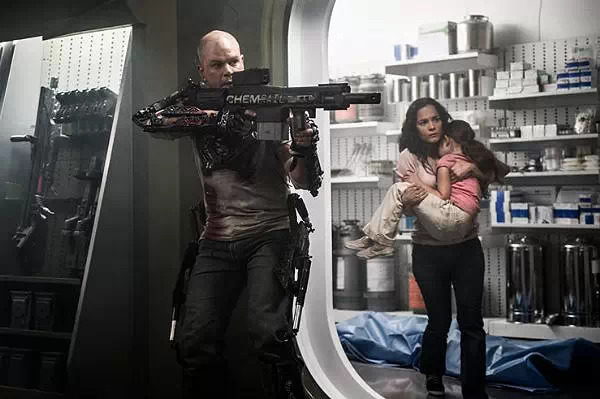 Welcome to “Elysium,” a science fiction film as low on science as it is on subtlety. I wanted to like it, I really did. Matt Damon plays likeable hero Max, a one-time criminal trying to turn his life around with a factory job. When a series of mistakes leads to him being exposed to lethal radiation, he sets his sights on getting to Elysium, the space station where the ultra-rich live. That’s the one place he can get cured. To get there, he needs the help of his old criminal contacts, who put him up to a very dangerous job in exchange for getting smuggled offworld. Of course the job goes wrong, there’s a girl involved (two, actually: Max’s childhood friend Frey and her daughter Matilda, played by Alice Braga and Emma Tremblay), and the “civilized” Defense Secretary Delacourt (Jodie Foster) employs the inhuman Kreuger (Sharlto Copley) to kill Max. There’s a lot to enjoy about “Elysium.” The visuals are stunning and evocative, the clean lines of Elysium contrasted with the worn and miserable state of the planet below. Damon is a good actor and a solid action hero, and goes through the paces of his straightforward character with craftsmanlike precision. If you’re into the sort of body horror that made “District 9” deeply uncomfortable, there’s plenty more of it here – but if you’re the sort of person who cringes at the words “bone saw” or the sight of a man’s face after a grenade has taken most of it off, this movie is not going to be your cup of tea. There’s plenty to dislike about “Elysium” as well, unfortunately, and I don’t just mean the gore, which I’m sure many will find distressing. The fight scenes are a mess, with lots of close-ups and unpredictable, odd use of slow-motion. The science and economics of the film are so unreal that it’s more accurate to describe it as “dystopian fantasy” than “science fiction.” The story offers us only two real female characters: a helpless mother who totes her dying child around like a doll and has to be rescued from the creepy bad guy, and a vicious, politically ambitious would-be dictator. Clearly we’re supposed to see Frey’s success (she left the orphanage where she and Max grew up to become a nurse) as a sign of her strength, but all the film lets her do is weep about her daughter and get rescued by Max from Kreuger’s sexual advances. Her entire function is as a plot device.Meanwhile, Delacourt (who is a contrast to Frey in literally every way, hair color, hair length, skin color, body language, class, you name it) is a definite villain, but one who relies on men to get anything done. She orders Kreuger and her various lackeys around, but never does her own dirty work – or even clean work. All she does is give orders and argue with her superiors. It’s disappointing that “Elysium” isn’t better. It had the opportunity to be a sci-fi fable about the divide between rich and poor, but instead it’s a ridiculous, sexist mess. Here’s hoping Blomkamp’s next film is an improvement. He gets good performances out of his actors and has a fantastic eye for visuals, but as a writer, he leaves a lot to be desired.